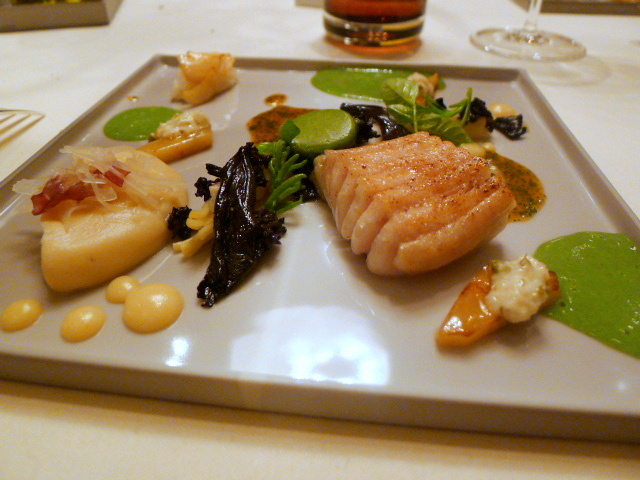 Last year, I was lucky enough to be invited by Executive Chef Thomas Bühner to his restaurant la vie in Osnabrück, Germany where I had a sublime dining experience. You can read about that meal here. At that point la vie held only two Michelin stars, but last November it went on to win its third Michelin star to become one of the elite few to ever reach this special level of achievement. 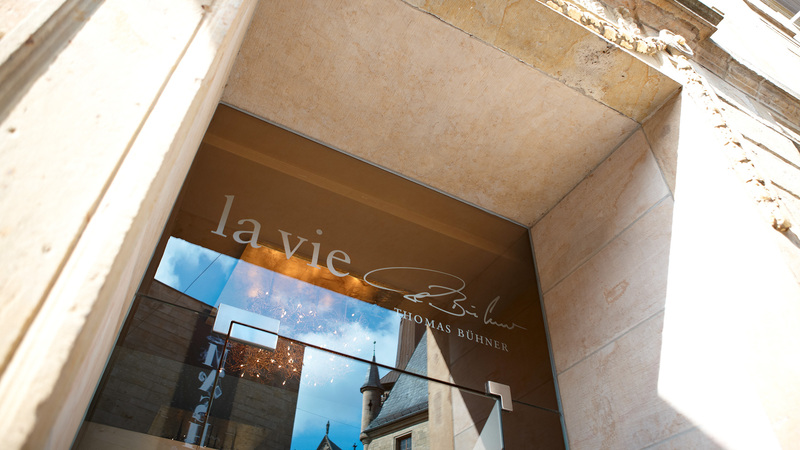 la vie was also a new entrant in the 2012 San Pellegrino Best Restaurant Awards and is currently ranked number 72. 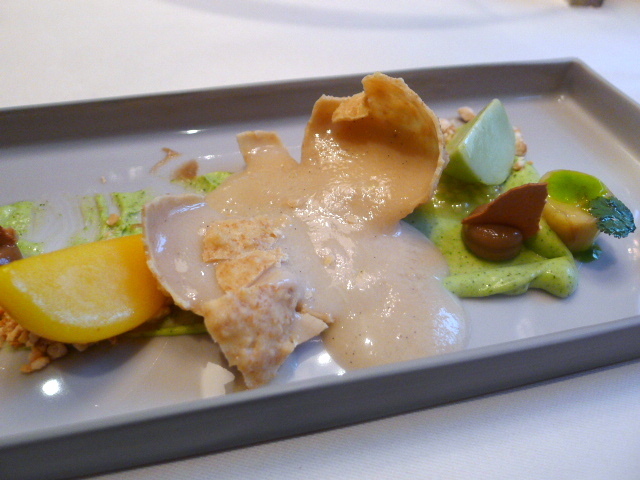 To sample its new three-star Michelin menu, I was again invited to la vie recently where we had a 3-course lunch (four-courses is priced at €89) followed by the gastronomic 7-course Le Grand Chef tasting menu for dinner (€198) with matching wines (€285). 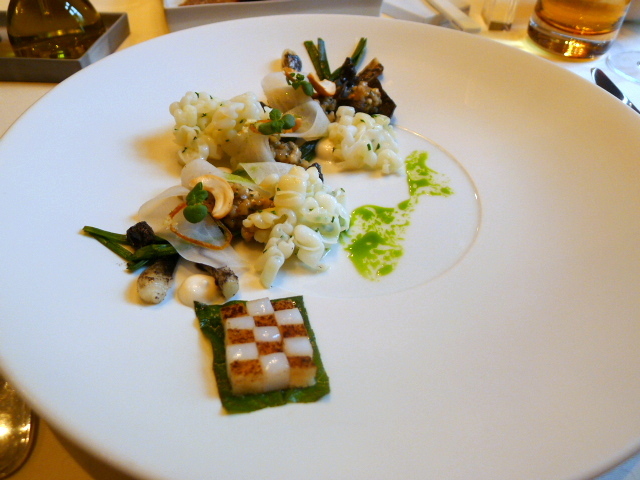 For lunch we commenced with a starter of cuttlefish, sepia, young leek and buckwheat that was simply stunning. 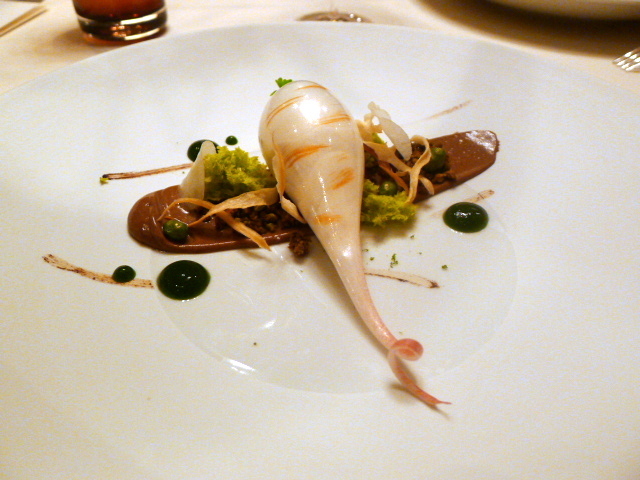 The cuttlefish was tender, and the leek, coated with a sesame powder, was lovely and sweet. The buckwheat, cooked with nashi pears, onion, leek and chicken stock, and perched on some tapioca and sepia ink kroepoek (crispbread) proved incredibly flavoursome. For garnish, there were fragrant shiso leaves, thinly sliced radish, fried shallots, cashews, and crunchy ‘rocks’ made with breadcrumbs and sesame, all of which gave this dish added flavour and texture. A mosaic of perfectly cut cubes of cuttlefish and nashi pear coated with a black garlic powder gave this dish a complex and exciting flourish. 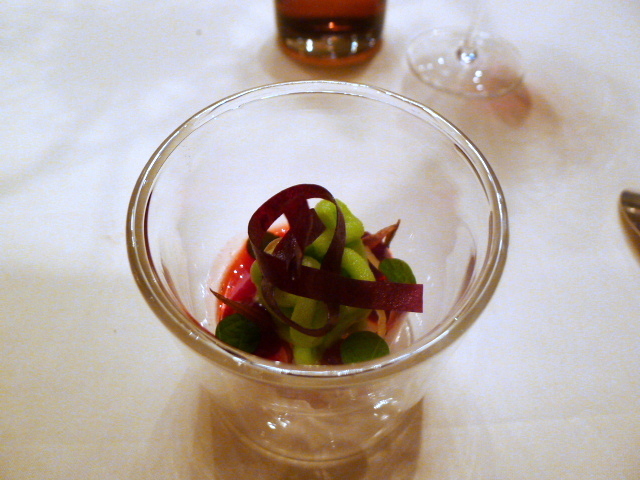 A sesame cream, nashi and radish stock reduction, and a green shiso coulis rounded off this incredible starter. 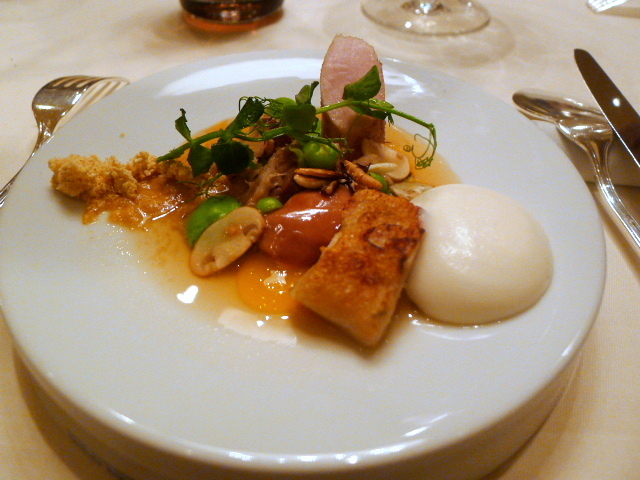 For a pre-main, there was a rich and splendidly creamy potato foam with pumpkin. It came with a curry ice cream that provided both an interesting burst of cold and a lovely curry flavour as you ate the foam. A perfectly cooked rib-eye melted in the mouth and was deliciously fatty and tender. 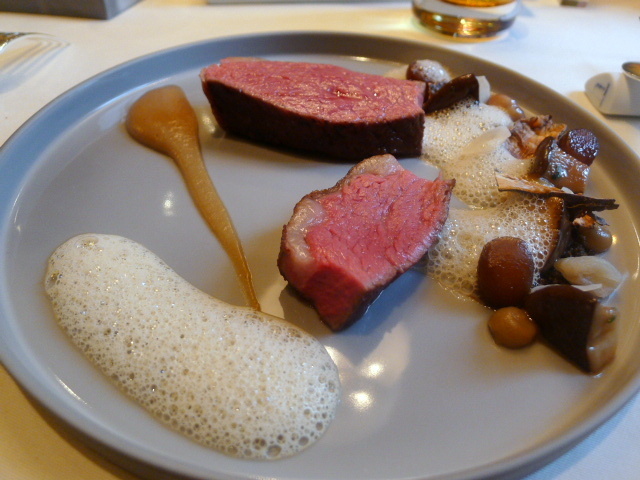 It was accompanied by some delicious king oyster mushrooms with deep-fried Jerusalem artichoke and smoked beef marrow that was intoxicatingly good. 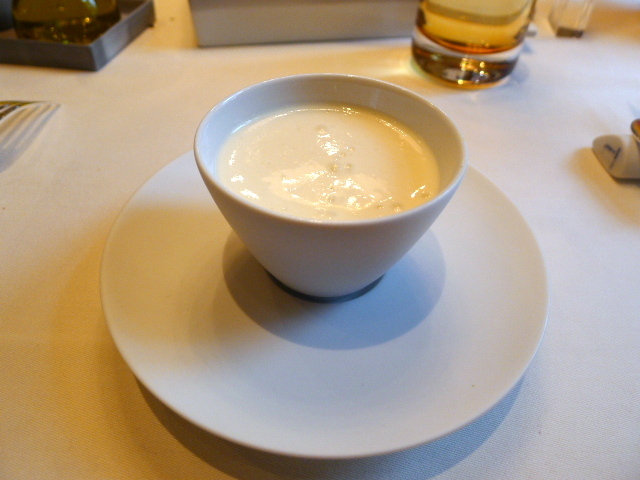 There was also a beautifully creamy Jerusalem artichoke puree as accompaniment. 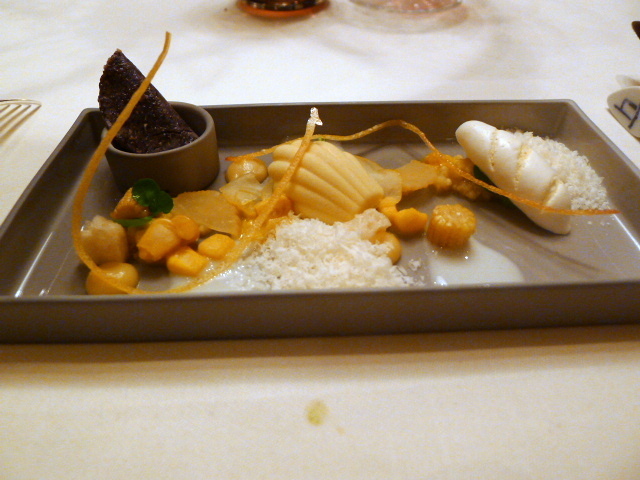 The dessert was also very complex and boasted numerous flavours. The centrepiece was a banana milkshake with lemongrass and ginger encased in a white chocolate ball with dried banana and yoghurt. The ball, when broken, revealed the runny goodness of the milkshake. There were also two delicious sorbets of kalamansi with passionfruit and coconut with kaffir lime, with the former proving particularly zingy and delicious. A coriander and coconut cream and a sprinkling of crunchy peanuts rounded off this lovely dessert. Dinner kicked of with an eclectic combination of amuse bouches including an avocado stick with tomato powder, foie gras with duck ham and sauterne jelly, a sepia macaroon with a smoked trout cream, lobster cream with basil oil, cannelloni of North Sea shrimps, and a Gillardeau oyster with apple foam. All were delicious and delicate. The first course was marinated hamachi with cauliflower three ways (creamed, puréed and sliced), quinoa, citron and dashi jelly on a sliver of monkfish liver. 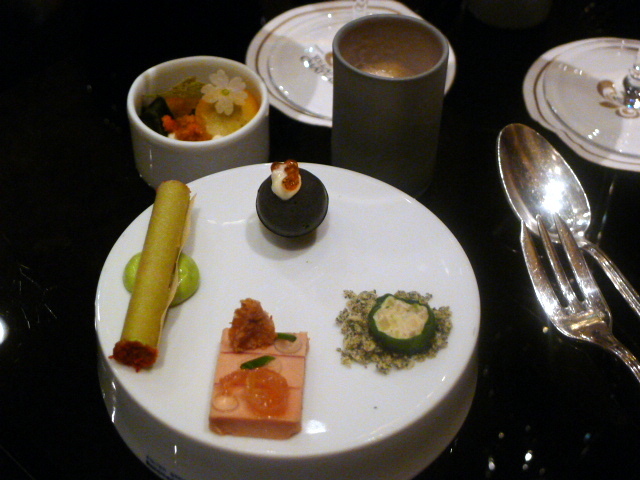 Individually, everything was expertly constructed and the acidity was well judged. 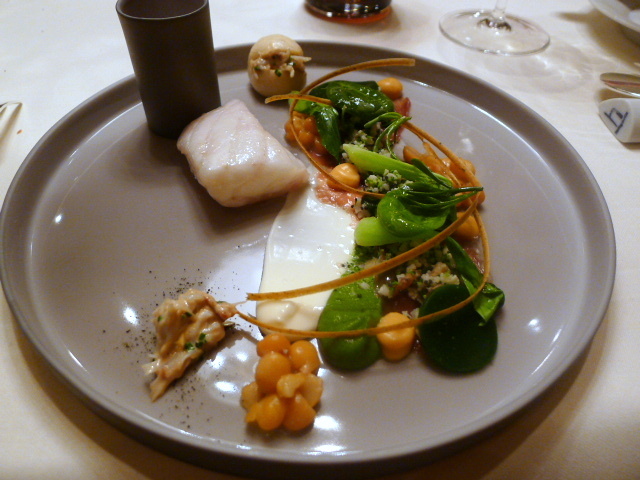 But the true genius in the dish seemed to lie in the fact that when the many elements of this dish were eaten together, it cleverly tasted like a dish of deconstructed sushi (paired with 2009 Riesling Kabinett trocken, Clüsserath-Weiler, Mosel). Beautifully cooked turbot, with some fantastic sweet crab and North Sea shrimps was served with broccoli two ways (creamed and jellied). There was also a little fluffy yeast dumpling as well. Lovely garnishes of sea fennel, pack choi and Spanish inula completed the dish (paired with 2011 Guru Wine & Soul, Douro). A dish of super-fresh skate cooked sous vide in brown butter followed, accompanied by an abalone nigiri that consisted of yuzu noodles with cubes of abalone covered with sliver-thin calamari. There was also a lovely chicken stock reduction with brown butter in a glass, a cream of celery, a zingy cream of yuzu, touches of miso, black chanterelles and an interesting aloe vera cream (paired with 2011 Silvaner trocken, LandArt, Franken). Fricassee of Bresse chicken façon de la vie with peas four way (puréed, creamed, cress and natural), was accompanied by a cream of egg yolk and delicately finished with a chicken jus. This was a delicious and satisfying dish (paired with 2010 Grauburgunder S, Keller, Baden). 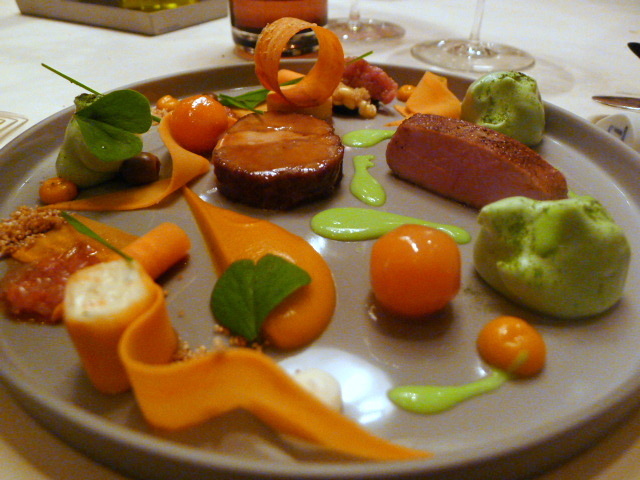 Lamb served three ways (neck, saddle and sweetbreads) was matched with variations of sweet potato, including a Comté cheese sweet potato roll. Little beads of amaranth provided crunchiness and grapefruit provided sweetness and acidity. Also as accompaniment was wheatgrass done as a purée, cream and jelly. Although this dish was executed with finesse, it didn’t work for me as the intense flavour of the wheatgrass proved to be overpowering against the lamb (paired with 2009 Domaine D’Aupilhac, Coteaux du Languedoc Montpeyroux). A cheese course of parmesan two ways (shavings and a meringue), maize ice cream, black maize quesadilla and pickled radish provided an interesting and unusual combination of flavours, with the quesadilla being particularly delicious. The pre-dessert was a delectable shiso sorbet with lychee, cranberry, a hibiscus infusion and dried hibiscus. Refreshing and sharp, both its sweetness and acidity was finely perched as if on a knife’s edge so as to push the boundaries of your palate. To the dessert – a sugar cone showed off incredible skill with its super thin, shiny, delicate qualities. It could be likened to that of fine glass, and when broken, it gloriously revealed a parsley root ice cream. There was also a wonderful cream of black garlic, cream of parsley and pistachio, crumbles of black garlic, pistachio and some dehydrated sponge cake. 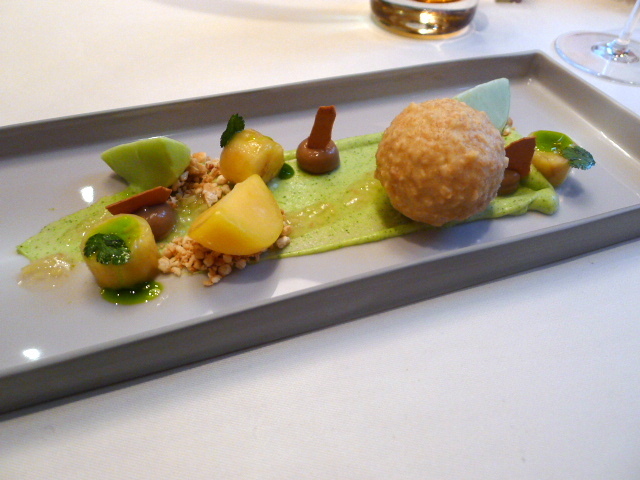 This dessert showed off incredible skill and finesse, as well as originality and imagination. It was therefore easy to understand why pastry chef René Frank was the 2012 Gault Millau Pastry Chef of the Year (paired with Williams & Humbert Canasta Cream sherry, Jerez). Petit fours included a cucumber gin and tonic, a beetroot sponge and a guava donut. There was also a sweet trolley containing a large array of dark, milk and white chocolates for the asking, each married with a variety of flavours. 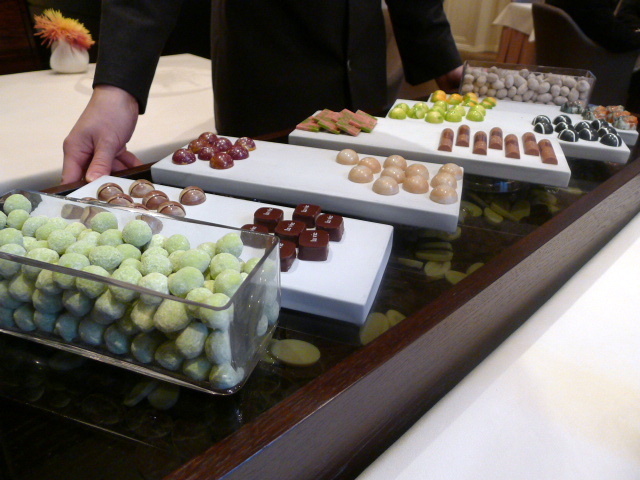 Particularly interesting were the Piedmont hazelnuts with yuzu, beetroot and passionfruit, white chocolate quinoa, strawberry with green tea, and chocolate with kalamansi. They were all delicious, and so delicately refined and skilful were their craftsmanship, they were perhaps some of the best chocolates I have ever tasted. My particular favourite was the Buddha head with 5 spices, pandan and yuzu – a true delight with its multiple layers of flavours. 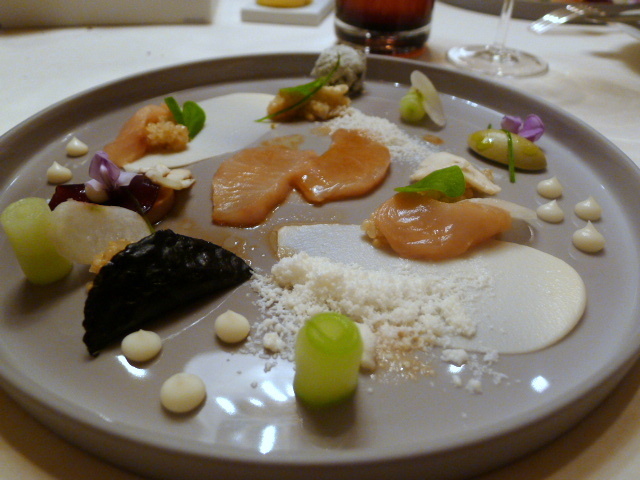 This was perhaps one of the most technical meals I have ever eaten in my life. Almost every dish contained numerous elements, and each of those individual elements was handled with precision and skill. The composition of virtually every dish was extraordinary, and it was difficult to keep count of all their various components. Take the sepia starter – this enthralled me with both its flavour and complexity and it will surely rank as one of the most memorable dishes of my life. I was less enamoured with the lamb dish, but regardless, this meal challenged the senses and invoked respect for its flawless execution. 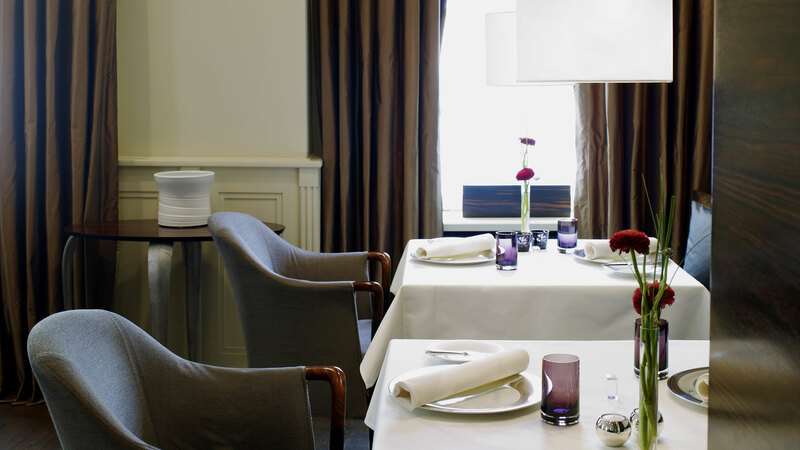 Five-course Tradition & Qualité tasting menu is €168, and with wine is €240. 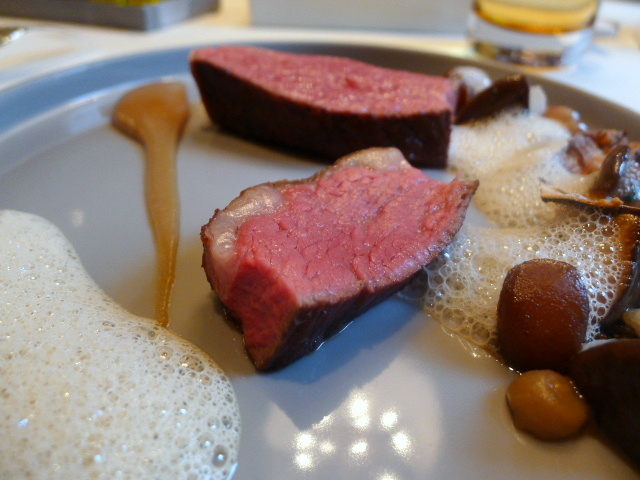 Seven-course Le Grand Chef tasting menu is €198, and with matching wines €285.